A forest is a dangerous place: a symbol for the unknown and the unconscious, both the embrace and the threats of nature and a natural state. In fairy tales, characters enter the forest to find themselves, but they inevitably find peril as well. 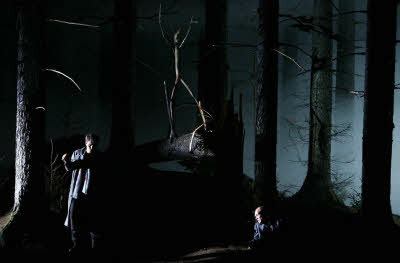 In this 2008 Salzburg Festival production on DVD (Amazon), Claus Guth stages Don Giovanni in just such a forest, a group of pines that rotate on a turntable to disorienting effect. Is there a world outside of it? Sometimes mist rises threateningly in the background. But despite the presence of a bus stop and Don Ottavio’s car, there’s no exit. 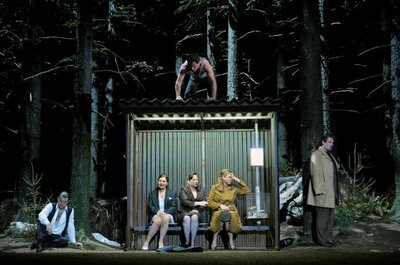 Don Giovanni and Leporello are a mortally wounded and drug-addled Vladimir and Estragon who are waiting for… something. The main disappointment of the production is Bertrand de Billy’s bland conducting. He goes with HIP fleetness, but the Wiener Philharmoniker plays with so much vibrato that the pitch in the overture actually doesn’t seem quite stable somehow. Fortunately the cast can both sing really well and carry off the complex production convincingly. Christopher Maltman gives an intense performance in the title role, with the kind of magnetism required of a Don Giovanni and a beautiful, fairly light voice. Other vocal highlights are Dorothea Röschmann’s powerhouse Donna Elvira and Ekaterina Siurina’s impeccable Zerlina. 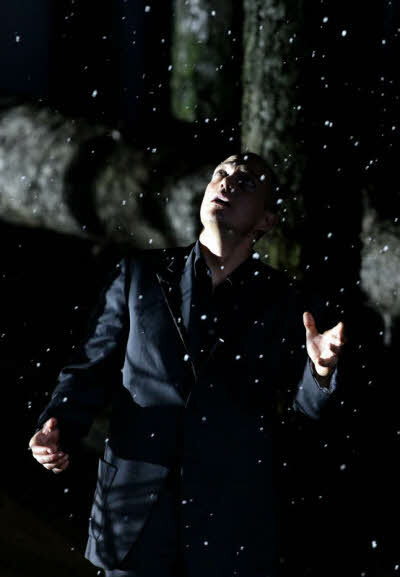 Theatrically, Erwin Schrott’s Leporello carries the show. I’ve seen Schrott as the Don in several different productions (I’m not a particular fan but there were a few years when you basically couldn’t see a Don Giovanni without him in the title role), but I wonder if he isn’t actually better as Leporello. It suits his low voice better, and also his wit and comic timing (his Don was sometimes too funny). Anyway, here Leporello is going through some drug issues and it isn’t going well. The cast’s only major weakness is Annette Dasch as Donna Anna, whose squally tone and iffy intonation are tough on the ears, though she acts well. Matthew Polenzani is a well-sung but rather faceless Ottavio. You know Zerb, I didn't like it that much when I saw this in 2008 but I did appreciate the purposefulness and specificity of the direction and so much great singing (I essentially agree with everything you say in respect of the music). After seeing the uber bland DG at the Met I thought back on this (among other) productions (even the old Met ones) and with some nostalgia . The Met production, though, seems to be especially problematic (though probably better then the mess you saw in Wien). My mom saw it last Monday and the new production in San Francisco this past Sunday. Traditional and in her opinion no theatrical masterpiece she though it was an incomparably better show (which however suffered in comparison with the vastly superior musical performance at the Met – with the exception of Kate Lindsey's superb Zerlina). Still, the excellent musical aspects at the Met only underscore what a terrible lost (and expensive!!!) opportunity this was. And that one in 2008 was also miscast! 🙂 I saw it with Schrott as DG and Ildebrando D'Archangelo as Leporello. Such a mistake 🙂 as Ildebrando is generally better as DG! Agh!! This production sounds really interesting. I love Don Giovanni, and I'd really like to see a non-traditional production.